An Atlantic City motel had a special guest Tuesday: an alligator. Animal control dealt with the 3-foot-long reptile. 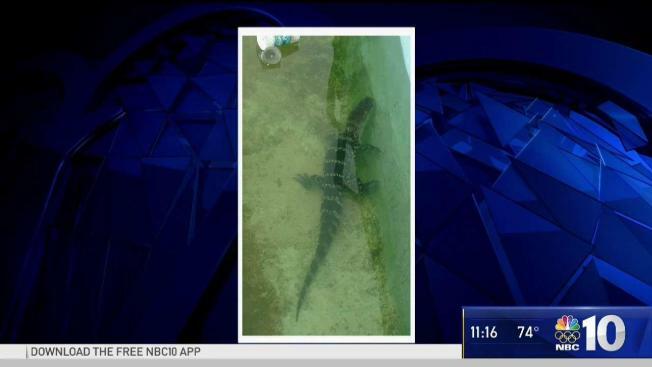 Crews have safely removed a 3-foot alligator that was found in a swimming pool at a motel at the New Jersey shore. The wayward alligator was discovered Tuesday at the Bayview Inn & Suites in Atlantic City while authorities were serving an arrest warrant. Jamal Campos, 25, was taken into custody and charged with the 2016 overdose death of Adam O’Gara, police said. Campos also faces heroin trafficking and distribution charges. Six more arrests were made during the raid, all of which were on unrelated warrants. Police said they found seven dogs, one of which was killed after acting aggressively toward an officer. Authorities say it's not clear where the alligator came from, how it got in the pool or how long it had been there. But they note the motel is a short distance from the Lakes Bay nature preserve. Animal control workers safely lifted the alligator from the pool around 10 a.m. It was taken to an undisclosed site.